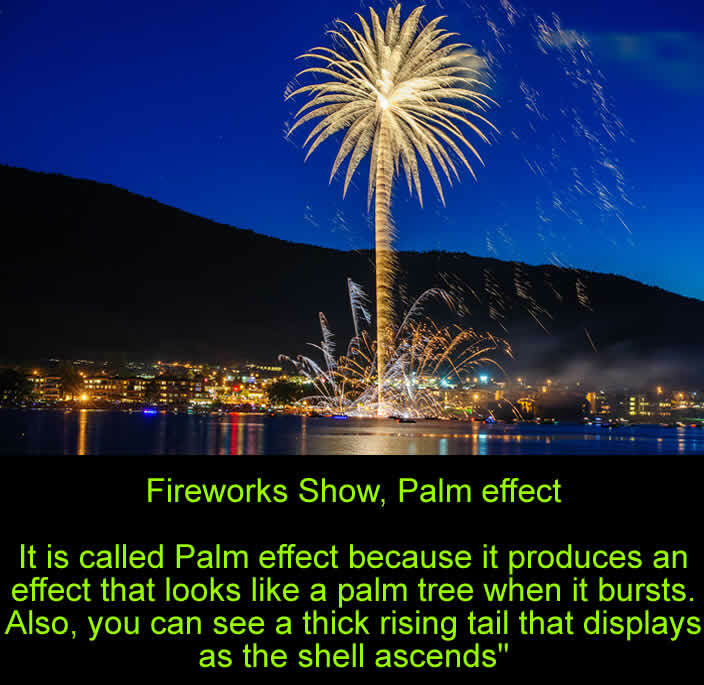 Fireworks Show, Palm effect is called as such because it produces an effect that looks like a palm tree when it bursts. Also, you can see a thick rising tail that displays as the shell ascends. In the present days, Fireworks can be quite complex and different types. Aerial fireworks are those designed to fire up into the sky. The most popular types of fireworks include: Peony, Chrysanthemum, Willow, Horsetail, Fish, Spider, Palm, Crossette, Kamuro, and Rings. The combination of these wonderful colored flames and their twinkling sparks are indescribably stunning. The descriptions of the beauties and thrills that come out of these fireworks shells have been summarized by the expression 'effects' and they are mentioned below.